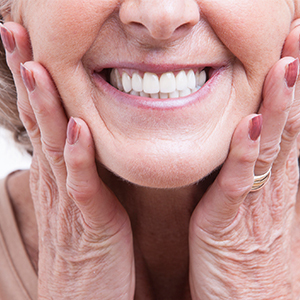 As we age, there can still be multiple problems associated with our teeth and gums. In order to keep our teeth for a lifetime, frequent exams, x-rays, and cleanings are needed to prevent the following problems. Yes, you can still get cavities around fillings, crowns, and on exposed root surfaces. As we age, our gums tend to recede and expose root surfaces. These areas are not covered by enamel and you may be susceptible to cavities. Dry mouth can be caused by our aging process and many prescription drugs. Our saliva helps protect the teeth from cavities and a lower saliva volume can contribute to cavities. 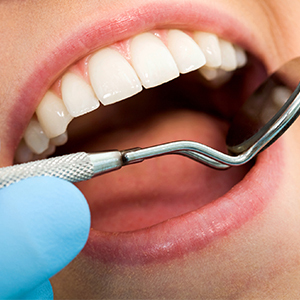 Poor oral hygiene and failing to have your teeth and gums checked can lead to gum disease. Once gum disease has started, it can cause gum recession and bone loss around the roots of your teeth, eventually leading to tooth loss. As gum tissue recedes, it exposes the roots which are more sensitive than the enamel. Special toothpastes and prescription fluoride toothpastes and mouth rinse, can help alleviate the sensitivity. Risks of mouth cancer increase with age. Exams at least twice a year can detect any suspicious lesions that may be biopsied to evaluate for cancer. Early diagnosis and treatment can prevent the cancer from spreading. Patients with dentures need to be evaluated not only for oral cancer but also for the fit of their dentures. 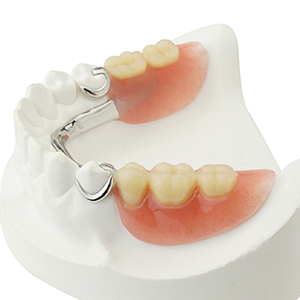 Ill-fitting dentures are not only uncomfortable but can cause damage to your gums. Ill-fitting dentures can sometimes be relined for a better fit. Dental implants are another option to make dentures fit better and give you the ability to chew food much more efficiently. Your partials may become ill-fitting due to bone loss in the areas where there were missing teeth. You may also get cavities around the teeth to which the partials attach. It is important to have your teeth cleaned, examined, and x-rayed to check for any cavities on the teeth to which the partials connect so the partial does not have to be remade. There are diseases such as arthritis that can affect your ability to properly clean your teeth. Toothbrushes may be modified to help you clean your teeth properly. Please do not neglect your teeth or dental appliances as you age. They can make life much more enjoyable when you can speak and eat comfortably. If you have any questions about taking care of your teeth as you age, please call our office at 903-708-6116. As a senior over 50 myself, I understand the challenges in maintaining optimal dental health but want to keep my teeth for a lifetime. "Dr. Bruyere and his staff are always so pleasant and caring. I had a dental emergency on the weekend and Dr. Bruyere met me at the office on a Saturday and took care of my issue, if that's not dedication then I don't know what is. I could list so many times when they have fit me in and taken care of me and my family. I've been going to them for many, many years. I can't imagine going to or trusting anyone else with my oral health. Thanks a million you guys!"